BENNETT 50 Feet x 13/16 Inch Preglued Melamine, Black Iron on Edging. 50 FT in Length by 13/16" (21mm) wide, soft forming Black Coloured melamine edge veneer tape with a thickness of 5mil. This Bennett edging is smooth coloured printed tape, with a flat finish. The paper is laminated with a melamine coating with a light stipple texture for durability. This gives the appearance of a gloss finish. This edge tape has strong flexibility, application for this edge tape will be easy around tight edges and curves. Enough flexibility to wrap around surfaces as small as the diameter of a quarter. Bennett melamine edge tape is also pre- glued for that clean and easy application. The process is simply, an iron on job with your very own home standard iron on Cotton Setting. This results in no special hardware tools, and no messy cleanups. This product is excellent for a fast and quick repair for existing cabinets and furniture. A great DIY product. BENNETT 50 ft x 13/16 inch Pre-Glued Melamine, Light Grey Iron on Edging. 50 FT in Length by 13/16" (21mm) wide, soft forming Grey Coloured melamine edge veneer tape with a thickness of 5mil. This Bennett edging is smooth coloured printed tape, with a flat finish. The paper is laminated with a melamine coating with a light stipple texture for durability. This gives the appearance of a gloss finish. This edge tape has strong flexibility, application for this edge tape will be easy around tight edges and curves. Enough flexibility to wrap around surfaces as small as the diameter of a quarter. Bennett melamine edge tape is also pre- glued for that clean and easy application. The process is simply, an iron on job with your very own home standard iron on Cotton Setting. This results in no special hardware tools, and no messy cleanups. This product is excellent for a fast and quick repair for existing cabinets and furniture. A great DIY product. DAP CrackSHOT Spackling Paste is a high performance spackling for filling holes and cracks in surfaces such as drywall, plaster, wood, brick and stone. It can even be used for filling dents in metal doors and trim. Its ready-to-use smooth, white formula spreads easily for fast, professional repairs that will not crack, crumble or flake. It has a de-aired texture for excellent tooling and easy smoothing to a feather edge. CrackSHOT sands effortlessly. It can even be finger sanded no sandpaper needed when sanding small nail holes or hammer dents in drywall. Just use finger to smooth dried spackling before painting. CrackSHOT provides unsurpassed paintability. It does not flash or gloss low sheen/flat paint. It accepts paint like bare drywall or other porous surfaces and provides a very smooth surface that disappears when painted. CrackSHOT cures quickly, but has a long working time and will not gum up on knife. It can be used indoors or out. 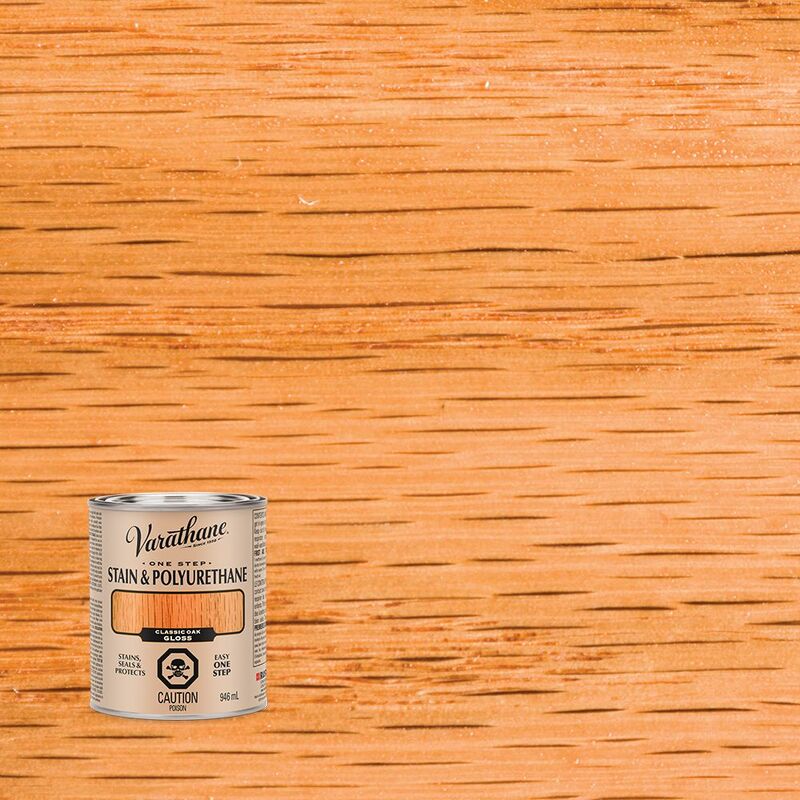 Varathane Stain & Polyurethane Gloss Classic Oak 946ml In one easy step, you can now apply both stain and polyurethane to your wood project using Varathane One-Step Stain & Polyurethane. Premium pigments provide deep, rich colour while Varathane's renowned polyurethane adds a smooth, even protective finish without brush marks.